A lawyer asked Jesus what he must do to inherit eternal life. 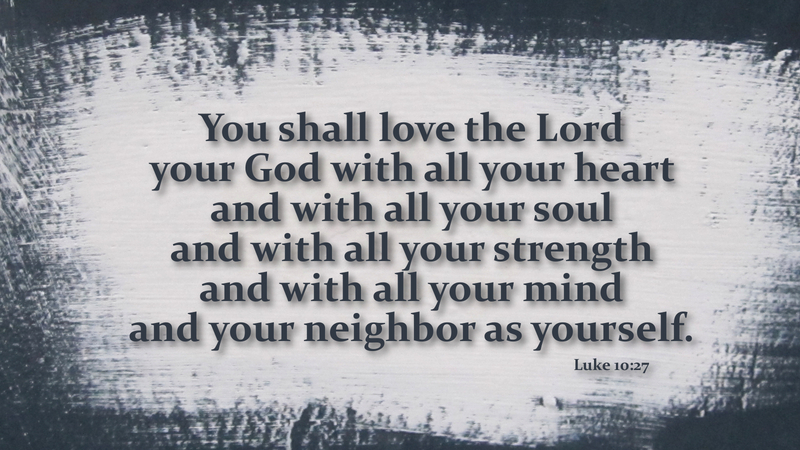 Jesus affirmed the lawyer’s understanding that we are to love God with all our hearts, soul, and strength, and our neighbor as ourselves. Then, the lawyer lifted up the bigger question asking, “Who is my neighbor?” Jesus responded with the Parable of the Good Samaritan. Being a neighbor does not simply involve loved ones and friends. In Matthew 5:43-48, Jesus elaborated including enemies as our neighbors. The truth is, most of us fail miserably in these two commandments that Jesus gave us—we have neither loved God with our whole hearts nor our neighbors as much as we love ourselves. What can we do to change this? We can begin with prayerful soul searching and reconciling with those we struggle with closest to home. Reach out in a spirit of compassion and a desire to improve the lives of those you touch. Open yourself up to the needs of those around you. Pray with them, and for them, extending yourself to them in whatever helpful and supportive ways you can. Loving our neighbor demands practice—in the name and Spirit of Jesus Christ. Prayer: Reconciling Father of all, daily guide us with your Holy Spirit to reach out to our neighbors in spirits of loving compassion and prayerfulness to promote healing and an enduring sense of peace now and always in the name of Jesus Christ. Amen.